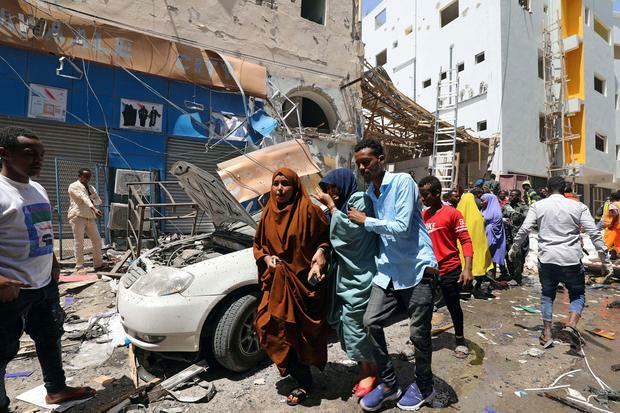 A car bomb exploded at a shopping mall in Somalia’s capital yesterday, killing 11 people and wounding 10 in an attack that police said was probably carried out by Islamist group al Shabaab. “Several dead people were removed from a wrecked building at the blast scene. So far the death toll is 11 civilians and 10 others injured,” police officer Mohamed Hussein said. A witness saw one dead person at the scene, where four cars were burned and a restaurant was destroyed. Al Shabaab frequently carries out bombings in Mogadishu and other parts of Somalia against the government and other targets. Al Shabaab’s militants also carry out attacks outside Somalia. Its latest assault in neighbouring Kenya, a suicide and gun attack at an office and hotel complex in the capital Nairobi last month, killed 21 people. Al Shabaab wants Kenya to withdraw its troops from Somalia where they are stationed as part of an African peacekeeping force which helps defend the central government.